Welcome to the Vegan 8 Korean! What better way to start off our blog than with kimchi? If you’re going to eat Korean food, you’ve got to get into kimchi. Koreans eat it with everything, and not only is it yummy, it’s very good for you. Filled with anti-oxidants, Koreans are very proud of their kimchi and tout it for its health benefits. In order to launch our blog in style, (and at the determined insistence of Sunnie’s parents who firmly argued that it would not taste as good without it) we decided to go out all and purchased a traditional pot to ferment the kimchi in, which Pinch (the tabby) and Puck were highly interested in. A good reason for vegans to make their own kimchi is that most kimchi has tiny brine shrimp ground up in it, making it non-vegan. There are some vegan kimchi’s available in the grocery stores around here, but they tend to be smaller jars and more expensive. Ultimately, the best argument is that if you make it yourself, you know exactly what is in it! There are actually many types of kimchi but we’re going with what most people would think of if you mention kimchi, (napa cabbage) baechu kimchi. 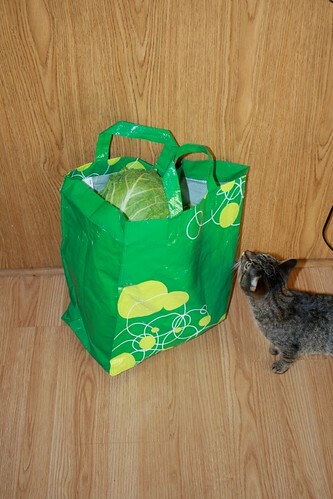 We bought 4 heads of cabbage, which our third and newest kitty, Mia, felt compelled to check out. She seems quite fond of many veggies but decided to leave these alone. The basic process here is soak the cabbage in salt water (we cut ours up first but typically the cabbage is only sliced in quarters and cut up only when you are ready to eat it). You then create a paste of garlic, green onions, red pepper powder, ginger. 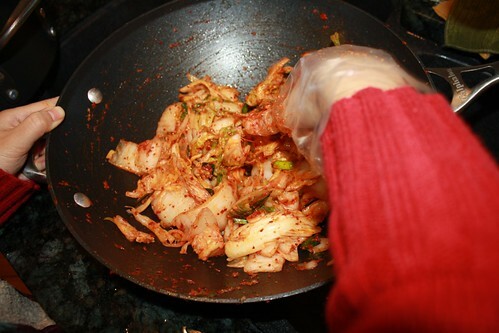 Kimchi making is something of an organic process, meaning you may like more or less salt or pepper powder, for example. Give it a taste as you and adjust as necessary. Also note that the more you rinse the cabbage after salting it, the less salty the resulting kimchi will be (to a degree). Finally, one final wisdom that everyone shares is that, if you make your cabbage in warm temperature, it will not be very good. Always be sure to make it in a cool temperature. When buying your cabbage, you’ll likely fill a 1 gallon jar with 2 – 2 1/2 heads of cabbage. 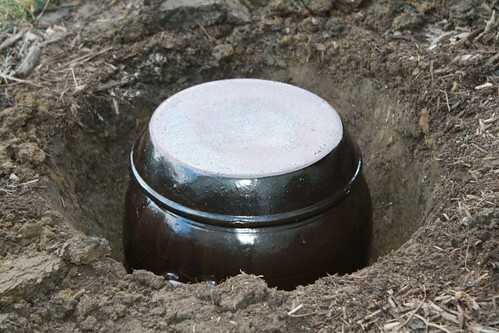 We made double that since we were filling the clay pot, but the recipe here will be to fill a typical 1 gallon jar. Wash the cabbage and cut in quarters lengthwise. (If desired, cut into smaller chunks (appropriate size to grab with your chopsticks). Put cabbage in a very large container and immerse it in salt water. Leave it over night, until you see the cabbage wilted. It should be wilted but still fresh – or it will be too salty. Puree (we use our food processor) the moo, garlic, ginger, white onion, rice and fruit and then matchsick the daikon. Mix all the sauce ingredients into the pureed ingredients. It shouldn’t be too dry, it should be a bit watery. If too dry, add some of salt water. If too watery, add more pepper powder. Mix it well with hand. It should get If you don’t use gloves, you’re going to feel a serious tingle from the pepper powder and be sure to keep those fingers away from your eyes and nose! Taste it and add salt or other ingredients so it tastes good to your palate, it should be salty and spicy enough for you to think it’s tasty. Let it sit and then some water will be coming out from the Korean radish. At the end, the sauce consistency should be a paste with a underlying liquidy sauce. If the salted cabbage is slightly wilted, take the cabbage and taste it. If it’s not too salty you do not need to rinse it and you can even keep the salted water to add it to your kimchi sauce. The salted water can seriously make the kimchi yummy. However, if the cabbage is too salty, you need to wash it. The more times you rinse it, the less salty the taste will be. Taste a leaf from each quarter. It should be salted enough, but not too salty. Here the wisdom and experience of kimchi making comes in – the newbies are never as good as the old ladies who have been making kimchi forever. SO – obviously, the more salt you add when soaking will also impact how salty the kimchi is as well as the length of time you need to soak it, so you can add more or less based on your taste and time availability. If it’s too salty and you washed your cabbage, make sure to squeeze out the water very well – you might want to let it drain overnight like many Koreans do. Use your hands to mix the paste in very well with the cabbage. Get to every little section/piece of cabbage! 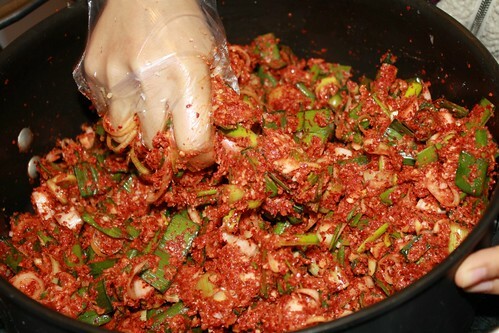 The more paste to cabbage, the spicier/stronger flavor your kimchi will be. 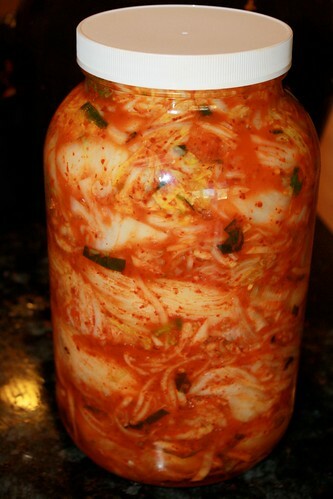 Place your kimchi into your jar and fill close to the top. Really push in the kimchi so it doesn’t have any space in between. You should have the water come up at least up to the middle. Mixing the cabbage with the paste. The finished kimchi in our pot! You need to leave a little bit of space at the top. There’s a nice line on the pot which serves as a decent guide for how deep to bury it. The lid seals in the kimchi. As we have a number of raccoons in the neighborhood, we thought we’d go with an extra layer of protection on the off chance that they might be Korean raccoons, so we added a flower pot to keep them from pulling the lid off. We also filled a jar, which we’ll eat while the kimchi in the pot ferments outside. You can leave the jar out for around 40 hours if you like or put it right into the fridge. Many Koreans buy these super-fancy kimchi refrigerators that will replicate the outdoor fermentation process by keeping the kimchi at the right temperature. 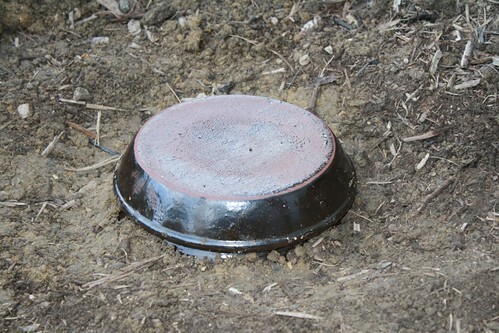 If you’re using a pot like we did, bury it in the ground but not all the way to the top. You want room to be able to get kimchi out without dirt falling in. You can also eat the kimchi right away, but it will continue to ferment becoming more bitter the longer it sits. Older Koreans tend to like really bitter kimchi. 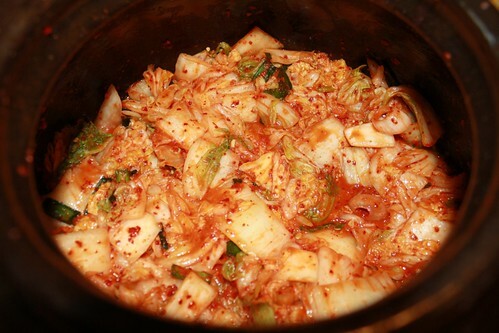 And bitter kimchi tends to be better for use in kimchi jigae (stew) and other cooked kimchi dishes as it makes them more tangy. Do note that if you are making kimchi with a pot, this is to be done in LATE FALL, when the weather is done being hot. You then can eat the kimchi out of the pot until the weather warms. I’m not going to kid you, making kimchi is hard work. In Korea, they often set aside an entire day where the whole family helps out in making huge amounts of kimchi to last for most of the year. But, it’s rewarding and nothing is more important in Korean cuisine than your kimchi. So if you make it yourself, you can get some serious bragging rights. Plus, it’s going to be way more cost effective than the tiny jars of vegan kimchi that are often the only vegan options in the grocery stores (at least around here). So give it a try and make your own kimchi! Great to see vegan kimchi out there! It is a lot of work, but once you’ve done it a few times it’s not bad at all and so worth it. I hope people will try this recipe to how easy and fun it is to make. I have been making my own vegan kimchi for a few years and it is very similar to yours. I usually make about 10 pounds at a time which lasts me 3-4 months. It’s awesome that you make your own kimchi, Julie. Very impressive! We’re working through our pot at a pretty fast rate and wondering if we shouldn’t have gotten a bigger one! How did you come to be a kimchi fan? I saw my first Korean drama, Rooftop Cats, about 6 years ago and that was just the begining! Being a vegan, I couldn’t find kimchi locally without fish. The Whole Foods Market sold some vegan kimchi, but it is almost an hour away and expensive. I bought a vegetarian Korean cookbook which is where I first learned to make kimchi. Last year I found Maangchi’s site and I veganized her kimchi recipe and this is the one I use now. 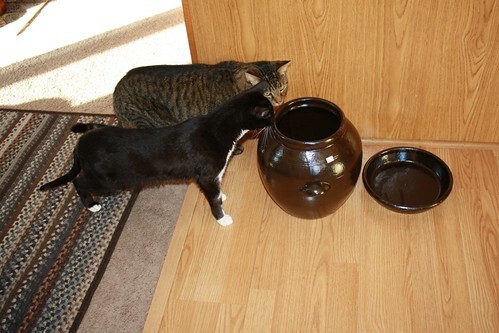 By the way, I love the photo of your kitties sniffing the kimchi pot. Ah, I haven’t seen that drama yet; although, Sunnie has and loved it. You’re definitely dedicated to your kdrama’s if it led you to making your own kimchi! We take our kdramas seriously too. I will pass on your compliments to the kitties! I use Korean pear in lieu of flour paste. Still vegan and even healthier for you, I think. Ah fantastic post! I’ve been really enjoying your blog lately. 🙂 I started to make homemade kimchi this year and have made it a couple of times already, it’s so nice to have it in my fridge – always prepared for an ’emergency’ (e.g. no veggies to be found anywhere, shops closed or for those times when you’re too lazy to chop something up). I agree with Julie, it becomes easier after some practice. I actually turned a whooping 13pounds of cabbage into kimchi just last Monday, I don’t think I have ever slept so soundly. It sure does tire you out, ha. I hope you don’t mind me asking, but how much do those traditional pots sell for? We have a large garden, so this would be nice for next fall.. Though I doubt I’ll be able to find a shop that carries them here, mhhh I wonder. Hi, Julia! It’s so wonderful to hear that you’ve been enjoying our blog, thanks so much! 😉 It looks like you have a really cool blog as well – we just checked out your yummy ddeukbokki! You have really pretty pictures, we’ll be visiting often. 🙂 I know, I personally really like using kimchi when I feel lazy… I just stir fry some kimchi and eat it with sliced warm tofu (a dish called “Tofu Kimchi”), and it is just so yummy. I love your blog. I love your kimchi pot. I am going to buy one of those pots and make my kimchi the traditional way next year. Our winters can be very cold with lots of changes in temperature. For example this morning there was snow on the ground, now it’s melting, they’re calling for freezing rain and then rain tonight and tomorrow it will go back down to below zero again. Won’t the jar crack. I have loved everything Korean since watching Jang Geum (I know I’m such a stereotype). Hi, Alice! Thanks for the kind words. I really don’t think you have to worry at all about the jar cracking. We had a winter of lots and lots of snow, but also freezing rain, sleet, and so on. In fact, at one point I meant to take a picture of our kimchi pot because it was underneath about 8 inches of solid ice from the freezing rain. You could literally ice skate across our lawn. The pot is still absolutely fine (I did have to wait for the ice to melt at one point before I could get more kimchi out!). 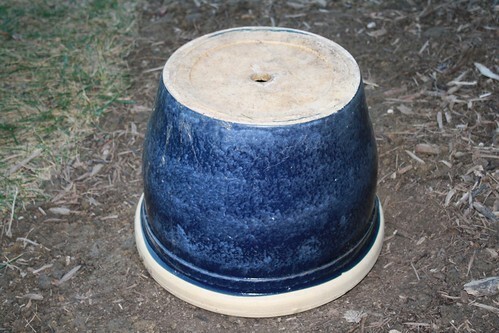 Koreans have been using these pots for thousands of years, and they traditionally leave it outside throughout the winter, so there should be no problem. Would regular red pepper flakes work ok? What do you mean by “ground pear”? Can I use a ripe local pear and grind it in the blender? What, if anything, can I use instead of kelp powder? Dear Sunnie and Bill, I am not able to find kelp powder but I can see that you recommend boiling soya with kombu, shitake mushrooms or kelp to substitute the powder. How much of this mix should I use? Thanks. PS. I love your blog. Thank you for sharing your recipes. Hi, Dominica. Thanks for finding us and for your kind words. As Sunnie mentions, it’s very much by tasting as you go and using your own preferences. You could get away with leaving the kelp powder out completely, or you could try soaking the mushrooms and kombu overnight, and then boiling it until the liquid thickens considerably, and then using 1 Tablespoon of the resulting liquid along with 1/2 a Tablespoon of soy sauce. Make sure the resulting liquid has a strong flavor. This will give a more complex and stronger taste to the kimchi. But honestly, we like a fresher taste, so we would just skip it entirely, particularly the soy sauce. If you don’t have kelp powder, you might lose a little of the complexity, but that doesn’t mean the kimchi won’t still taste good! Hi there. Thank you for sharing this recipe. My biggest question is this… It’s summer now and I want to make kimchi. I do have a fermenting crock but where do I let the kimchi sit during summer? Hi, Madison! In the summer, it’s really too hot for you to leave the kimchi pot outdoors, so you pretty much have to just refrigerate your kimchi right after you make it. You could let it sit for a day, but beyond that will be problematic. So unless you have a big fridge, you likely will have to wait to use your crock in the fall! Oh, I hope you get this today. I made a mish mash of your kim chi recipe and another one. My kim chi has been fermenting for two days now and ready to go in the refrigerator; however, the cabbage is not covered with liquid. Is this critical? Do I need to add water to it before I put it in the fridge? Toss the cabbage out? I don’t see any mold (I have not opened it yet). There is liquid, just about half way up the jar. Thank you. I added a bit of water as I decided that it probably was too salty already. After 4 days out of the frig and one week in we finally ate it and my husband and I are still alive. I was really impressed that I could make such a thank. I used the Korean Chili powder past as I didn’t have the flakes and I think it altered the flavor a bit, but definitely still edible and definitely spicy since I didn’t alter the flavor. I am going to peruse your site now for some cucumber recipes. Keep the great recipes and stories coming! Hi Kate! Ah, I see. Glad to hear that. Hopefully next time you can use pepper flakes, it makes a huge difference! 😉 We will add some cucumber recipes very soon! Thank you for posting this recipe! I am making my first batch now. I must say that the napa cabbage that I bought are so large that I am having to use several large bowls. A friend turned me on to Korean food several years ago and I loved it so much that I forced her to walk me isle by isle at a local Korean market so I could understand what everything was and how to cook my own Korean food. I can’t wait foe my kimchi to become sour enough to make kimchi stew! I will let you know how my first batch of kimchi turns out. Love your blog btw. Cheers! Hi, Lee! Looking forward to bitter kimchi for kimchi jigae is a true sign of the purity of your Korean obsession! 🙂 I know what you mean about the size of the napa cabbage. Our local Korean market sells some enormous bowls for making kimchi that makes it a little easier. We’ve been making some smaller batches ourselves lately in preparation for when it gets a little colder and we can put our kimchi pot into the ground! Thanks for your kind comments and do let us know how it turns out! thanks so much for the recipe! It was my first venture into making my own kimchi and you weren’t kidding when you said it’s a lot of work! I didn’t have a gallon size jar so I just did a few quart sized jars. I left them out overnight and then put them in the fridge this AM. I didn’t have really any liquid in them so we added about a 1/2 to 1 cup water (hope that’s ok?). So now I am wondering how long we should wait to start eating them and how long they will keep? Hi, Niki. First of all congrats on your first batch of kimchi! Sunnie says adding water is fine but not necessary, but usually you’ll want to do that in the beginning before you set it out if you do want to add it. You can start eating your kimchi right away if you’d like, but for fermentation to occur, leave it out for a couple of days. It should keep in your fridge for months and months; although it will get more bitter. But bitter kimchi is preferred by older Koreans and great for kimchi jigae. Enjoy! Coolness… I made kimchi with round head cabbages (green and red mix) in place of napa cabbages. In fact, there’s a video for it called “yangbaechu kimchi.” Check it out if you don’t know what it is. Ever since making my own vegan kimchi, my mum keeps buying chinese cabbage whenever they’re on sale and what happens?! I get stuck in the kitchen for the rest of the day! LOL. It is now a staple of my meals! Thank you so much for publishing a vegan recipe for kimchi! I’ve been dying for some ever since I watched Gourmet (I’m watching Jewel in the Palace now) but I can only find kimchi that has fish in it in my area. I want to make sure that I understand what you’ve written correctly … since I (sadly) do not own a kimchi refrigerator and am unable to bury the earthen pots (I can’t even find them! ), I should leave the kimchi I prepare in an airtight container on my countertop for no more than 40 hours to ferment and then put it back in the refrigerator. Is that correct? Thanks in advance for your help! BTW, I love the picture of the kitties. I can see my kitty doing that, too! Yes, 1-2 days outside on your countertop in an airtight container and then put it in the fridge! Sunnie and I sometimes like our kimchi fresh, so we don’t even leave it out and put it straight into the fridge. So it all really depends on your taste. Thanks for the compliments on our kitties and enjoy Dae Jang Geum; it’s one of our favorites! You might check out Kimchi Family too if you want some more inspiration! It came out at the beginning of this year and instantly entered our top 5 all time dramas list! I can’t believe I forgot Kimchi Family! I watched it when it was first came out on DramaFever. The cinematography around the kimchi making was stunning. They could have made the entire drama on that and I would have been mesmerized. I enjoyed Le Grand Chef 2: Kimchi Battle, too, which I guess is the 2-hour version of Gourmet (or Gourmet is the 30 hour version of it!). I do wish Netflix would get the first one in the Joseon period. I’d love to see it. Thanks again for your help! And please do consider writing a cookbook. I’m so happy to find a vegan kimchi recipe! I just had a question about the fermentation process… I’m planning on making my first batch in many smaller jars, so that I can give them out to friends. I remember my mom used to always take her jar of kimchi and leave it in the sink with the lid just sitting on the top (not sealed) so that the kimchi could “breath” for about a day. Do I need to do this, or should I just seal the jars completely? Do mason jars work okay? Hi, Jessica. Sunnie says that if you don’t seal the jars, the kimchi will ferment so it is more sour or bitter, so it’s up to the taste you prefer. And any jar would be fine! Good luck and thanks for finding us! NB: I’m not associated with the author or Ten Speed Press in any way. I’m just a vegetarian kimchi lover! Do let us know if you try it out yourself and what you think! Sunnie, may I ask your kimchi advice even though I didn’t use your recipe? I don’t know why I didn’t think to use yours in the first place, but I was trying out recipes from Ani Phyo’s raw Asian cookbook this weekend, and, well, it just kind of happened…. Anyway, it’s a mat kimchi recipe that calls for you to cut up the cabbage in small pieces and salt it and basically do as in your step #4. But at that point, it says to reserve the water you squeeze out after the cabbage is wilted and rinsed, then put it into the container with the seasoning mix. That’s where I went wrong; I didn’t reserve the water, and so when I went to put my kimchi (all mixed up with the seasonings) into the container to ferment, it had almost no liquid in it. A few hours later, I checked on it and noticed it still seemed really dry, so I re-read the recipe I was using and realized my mistake. I didn’t want my cabbage to rot or mold, so I added some water…. then some more salt and gochugaru for good measure, because it looked diluted. What do you think– Did I ruin my kimchi and the fermentation process? I guess I’ll know in a few days, but I would love some expert thoughts. Thanks so much. Hi Lu! I hope things turned out ok, even if was very dry and you didn’t put water in, it always leaks out more water during the fermentation process. So it shouldn’t have been a bug problem. Let me know how it turned out. Hope it looks good! Hi, Sunnie, and thank you for the response. 🙂 I’m not optimistic today on Day 2/3 of the fermentation process. It hasn’t given out much more water, so I pushed it all down as flat as it would go so it would at least stay moist. I think I wilted it with the salt for too long, so when I squeezed out the water, I lost a lot more that would have otherwise come out during fermentation. It doesn’t really smell that “active,” if you know what I mean. Kind of like when you try to make bread with expired yeast; if you’ve ever made that mistake, you’d know that dead and lifeless feeling. But I’ll give it another day and see! I currently live in southern AZ where temperatures are extremely high (currently it is 91 degrees and will only increase in the past few weeks). I am worried that by burying it outside, it will bake instead of ferment. What are your thoughts? I guess I could just do a pot for the fridge..
Hi, Mona. Yeah, way too hot. Even in Korea, they ferment kimchi during the winter, so you’ll definitely want to use the fridge instead! Good luck! Thank you for the recipe! It turned great! Yay! I made my first batch of kimchi!!! So proud of myself! I’m from Sydney, and the labelling of Kimchi ingredients there is suspicious. I’m pretty sure there’s something fishy about it. There’s a smell…. Now I moved to San Diego and found 1 brand of vegan kimchi at Wholefoods, and it was so good, but not really spicy. It also didn’t last long. What to do? Zion Market on the weekend! I bought 1 napa cabbage, just to start small, in case it turned out bad. I also got plain rice flour instead of glutinous rice powder by mistake. In any case, also left out the onion, radish and green onions. Accidentally tipped too much gochukaru in! So it ended up waaaaaay to spicy. Luckily, I had some white kimchi which was mixed in to dilute the gochukaru, and it tastes so good! I brought some in for my veggie friend to try at work and they thought it was authentic! The kimchee is running out faster than expected. A good problem to have. One thing that is weird: did you ever use your bathtub to make kimchi? I only used 1 cabbage and I had to use a bucket to salt it and mix it. Nothing else would fit it all comfortably. If making a batch with any more than 3 cabbages I can’t imagine what is big enough to contain all the pieces. Sounds like quite the process! Congrats on your first batch – a huge accomplishment! Now you’re ready for full on kimchi adventure! We actually buy huge plastic bowls from the Korean grocery store that are typically used for kimchi making. They’re not too pricy and most stored carry them. So glad your first batch was a success! Hi! Just wanted to say that I love your blog and was so excited when I found it! Also, I have a question about your kimchi pot. I have an old one, but I’m trying to find a new one because one just isn’t enough! I would love if you could recommend the best brand to get, and maybe some suggestions on where to find it. That’s awesome, Kristina! Congrats! Yes, cooking with kimchi is fantastic. We often will do a quick stir fry of it and have it with tofu. Delicious! Hope you’ll try some of the other recipes and continue your exploration of Korean cuisine. Thanks for letting us know how it turned out! Hi there, I’m a vegan too, and I like Korean food especially Kimchi!! Love your blog, so informative and many recipes that I like! The thing is that I can’t take onion and ginger so just wondering if we can make this recipe without those 2 ingredients? Yes, if you can’t eat those, you can just make it without! Awesome! Congrats! We are always tweaking and trying different things so the experience will come! Keep in mind, you can just eat a little if you can’t wait and eating some while you make it is part of the fun! Hi! Totally want to try out your recipe. Looks delish and I love that there’s no shrimp! A question though…I see a lot of mentioniong of kelp powder in the comments but don’t actually see it in the recipe?! I actually do have some so I’m wondering if I should include it (and how much?) Thanks!! Hi, Jillian! We used to use it but updated the recipe as we didn’t really think it was necessary. If you would a bit of the fishy taste, you can add it to the paste at the beginning – I’d say a teaspoon. Hope you enjoy! Thank you! Thank You! Thank You! for the vegan KimChi recipe. I have been looking for some direction for a while. A lot of mention is made about temperature. i live in Los Angeles where it is warm pretty much all the time. Some say to leave the kimchi out some not? I’m confused. Hi, Calen! Kimchi making season is in late fall traditionally, so if it’s pretty warm, you might want to just store it in a refrigerator instead. Unless you fill the jar to near overflowing, you shouldn’t have to keep the cap loose. But leaving it loose can also let some air in which can speed up fermentation. So if you’re nervous, just keep it loose! I hope that helps. Hi Guys! LOVE your blog!!!! My daughters and I TOTALLY OBSESSED with the Korean culture. We watched “Moon Embracing Sun” and we were HOOKED! lol My daughter will be bringing 2 Korean girls home with her from college over the Christmas break. We are totally going to be using the recipes off your blog! We want to try to make Kimchi, since it’s a staple of the Korean diet. I’m not sure about the whole fermenting process. I want to put the jar in the fridge instead of outside but how long should the kimchi stay refrigerated until the fermentation process is done? Wish you would blog more!!! Hi, glad you enjoy the blog! I know, we’ve become so busy with our little guy that the blogging has slipped. I have a backlog of posts I haven’t managed to push out, but I shall strive to do better! Follow us on Facebook or Twitter for more content (albeit, shared, not our own). Twitter tends to be more animal rights focused, while Facebook has more of the general stuff. I have made this kimchi many times since I discovered your method. Soon I’m leaving for the grocery store to pick up ingredients. 🙂 Thank you! It’s one of my favourite foods on the planet. That’s awesome to hear. Thanks for letting us know!